A good bowl of New England clam chowder never fails to brighten my day and it’s a fun surprise when I find it on a restaurant menu. For me, it’s a feel-good soup – right up there with Adele’s Matzo Ball Soup and Minestrone. The base is rich from the clams and clam juice, and made even better with potatoes, milk, cream and bacon. There are so many ways to make this chowder and I wanted to create an easy recipe that I could whip up at home; I started experimenting several months ago and bombed the first batch by adding carrots, too many potatoes and too much bacon, adding sherry (yuck!) and seasoning it with fine herbs. But I wasn’t giving up, I wrote down the recipe in my little binder, kept refining it and made a few discoveries: using clam juice in the broth gives it instant flavor, a little half & half makes it extra creamy and a pinch of sugar brings all the flavors together. So here you have it, the well-tested version from my kitchen. The recipe is simplified by using canned chopped clams – my grocery store carries some that are wild-caught in the U.S., so my pantry is always stocked for instant dinner options. For more flavor, I roast the potatoes with a bit of olive oil, salt and pepper rather than boiling them. Russets were used in this batch (peeled and cubed and then slightly smashed after cooking) which worked great, but my favorites are the baby Dutch potatoes because they have thin skins, cook quickly and have a creamy flavor. The soup starts with some rendered bacon lardons (bacon pieces cut into ¼ inch wide strips), sautéed onions, celery and fresh thyme, some garlic and sugar and then finished with clams, clam juice, milk and roux. It’s a fairly simple recipe for such a delicious bowl of soup. 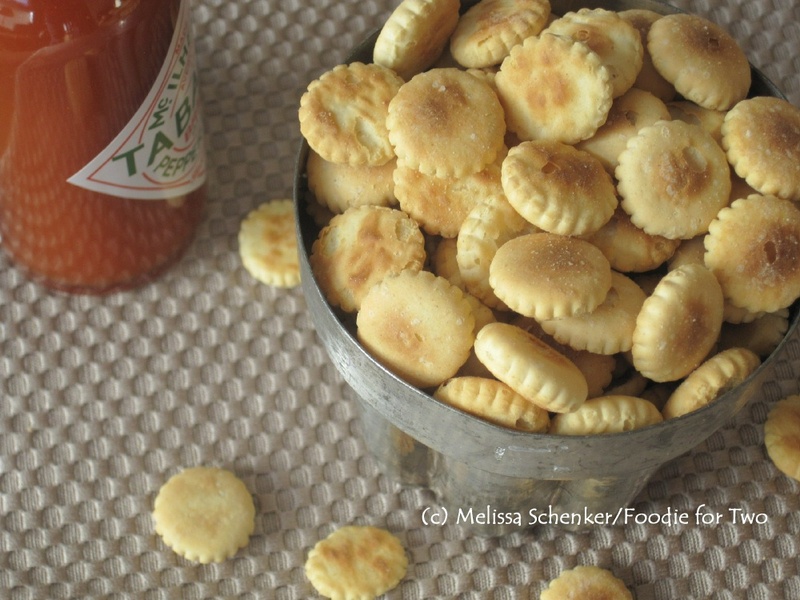 Oyster crackers are a classic finish to the chowder; they taste like a saltine cracker but with lots more flavor and crunch. I like to garnish with a few dashes of Tabasco sauce for a subtle kick, and some chopped fresh chives for a bit of color. 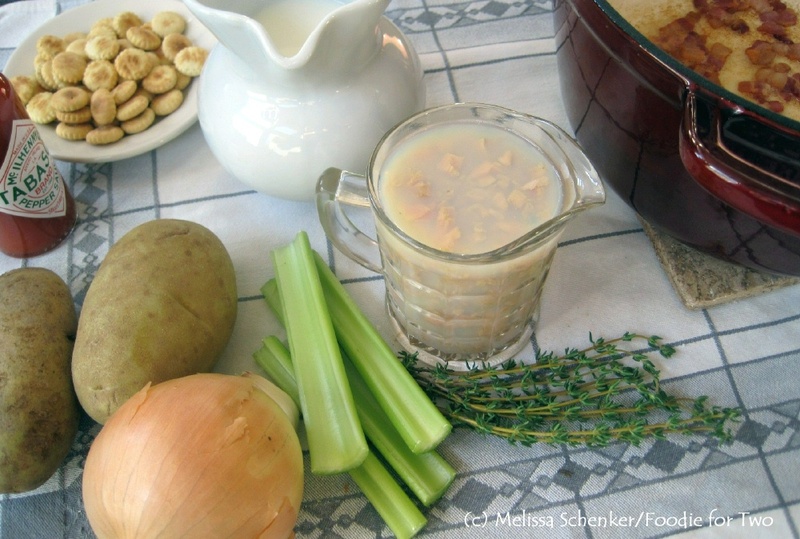 I hope this New England clam chowder recipe brightens your table and becomes a favorite in your own kitchen. Heat the oven to 400 degrees F or toaster oven to 300 degrees F. Add the potatoes to an oven-proof dish and toss with a few teaspoons of olive oil and some salt and pepper. Cook for 25 to 35 minutes until just knife tender. Let cool a few minutes and lightly smash; if using baby Dutch potatoes, cut into slices or cubes. In a Dutch oven or large stock pot over medium heat, cook the bacon pieces until crispy and browned. Turn off the heat and transfer bacon to plate lined with paper towel; remove all but 1 tablespoon of bacon drippings in the pan. Let bacon cool and set aside 1 teaspoon for garnish. Return pan to medium heat and sauté the onions and celery with a drizzle of olive oil, fresh thyme, 1/8 teaspoon salt and 1/8 teaspoon pepper until soft and translucent, about 15 minutes. Add the garlic and sugar and let cook for 30 seconds, stirring constantly. Add the canned clams and their juice, clam juice, milk, half & half, roasted potatoes, ¼ teaspoon salt, 1/8 teaspoon pepper and the cooked bacon pieces; let simmer on medium for 15 minutes, stirring often. Make the roux: melt the butter in a ramekin (or small glass bowl) in the microwave on 10 second increments until melted. Add the flour and whisk in with a fork. Add roux to the soup and stir well to dissolve. Simmer for another 5 to 10 minutes until chowder thickens, stirring often. 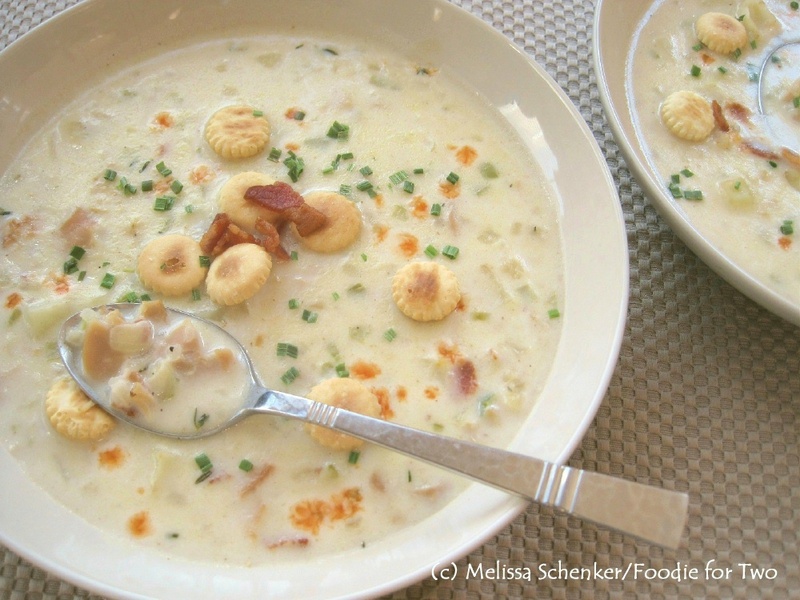 Serve chowder hot and garnish with Tabasco sauce, oyster crackers, extra bacon pieces and chopped fresh chives. A cocktail rather than a drink, that’s what I had in mind this week. A cocktail that’s a bit more sophisticated and feels like a grown-up drink, one that you can savor on the back patio while discussing the events of the day with your loved one or friends. Our friend’s, Holly and Kurt, first introduced me to a Brandy Old Fashioned and it is one of my favorite cocktails; I don’t have it often but recently discovered it is easy to make at home. This retro cocktail is made with a sugar cube, bitters, Sprite (or 7-Up), cherries, brandy and finished with an orange slice. True mixologists will add a “flag”, a skewered orange slice with a cherry in the middle. Bing cherries are in season so I used them instead of the maraschino cherries. A Brandy Old Fashioned has a refreshingly sweet and light flavor and is an elegant way to transition the week into the weekend. It’s always fun to nosh on something equally as delicious while enjoying a cocktail, and Bacon Grissini are perfect with this cocktail. They are basically candied bacon on bread sticks. Yes, please! Wrapped and ready to be cooked…….I always thought they looked like candy canes at this point. Grissini sticks came from my catering days. Instead of the 8 that I made for the two of us at home, it was a production line of 60 to 120 grissini sticks! They were always the appetizer that was gobbled up; the servers could barely get around the room before the platter was empty. After the bread sticks are wrapped with a bacon slice and almost cooked, they are coated with a spicy sweet brown sugar mixture that caramelizes around the bacon after more oven time. They are a sweet and savory treat with a crunchy texture from the bread stick. 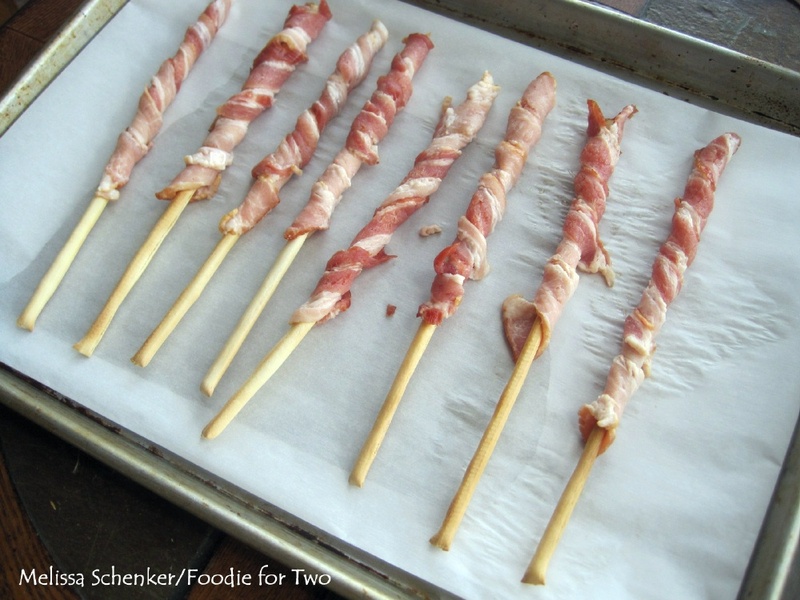 It takes some practice to wrap the bacon around the sticks without breaking any (some days I would break about twenty percent of them, usually just at the end of wrapping) so take it slow and try to keep slight tension on the bacon piece as you wrap it around and down the bread stick. If you can find thinly sliced bacon, with more meat than fat, it will make it easier. You won’t need the whole slice of bacon so cut off the last quarter and save for later (freeze in a Ziploc bag for 2 months). They take about 30 minutes to bake and are so worth the wait. 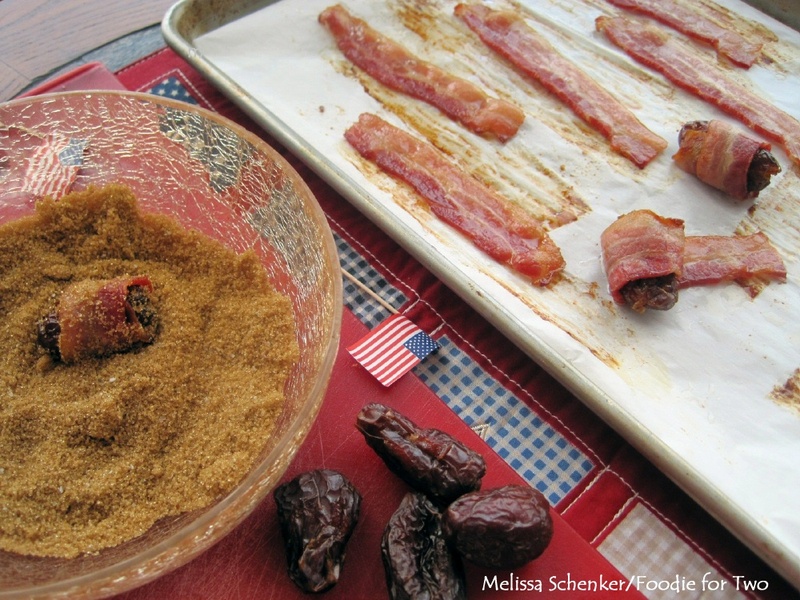 If you’re looking for more bacon candy, check out my post on Bacon-wrapped Dates. 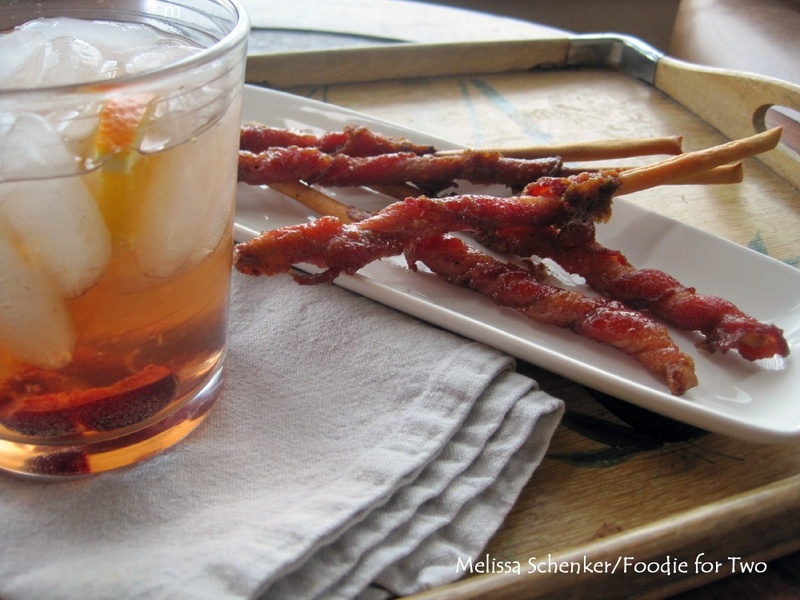 Ahh, a Brandy Old Fashioned cocktail and some Bacon Grissini Sticks…….. It’s a better week already. Cheers to you and yours! In a cocktail glass add the sugar cube (or sugar) and bitters. Add a splash of Sprite and the cherry and muddle until the cherry is slightly mashed and the sugar is dissolved. 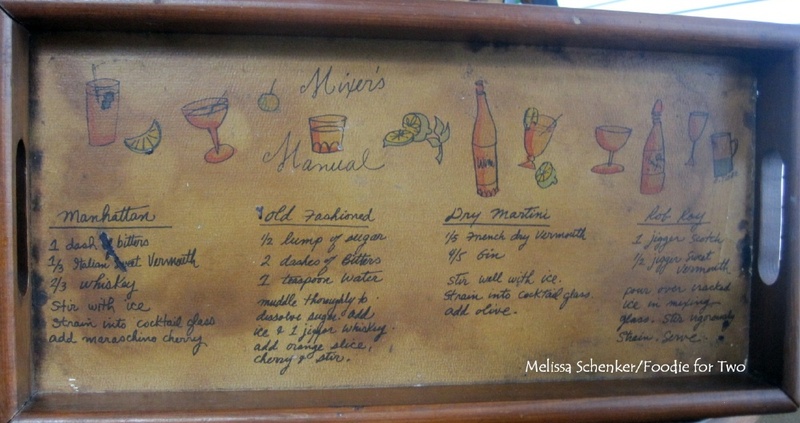 Add the brandy, the ice and top off with Sprite. Garnish with an orange slice, or a “flag”: an orange slice skewered with a cherry in the middle. Repeat process for two cocktails. Heat oven to 375 degrees F and line a sheet pan with parchment paper (this keeps the grease off the bread stick ends and helps contain the mess). Add all ingredients to a small shallow pan that is longer than your bread sticks. Mix well and set aside. Cover with plastic wrap until grissini sticks are ready so the sugar stays moist. 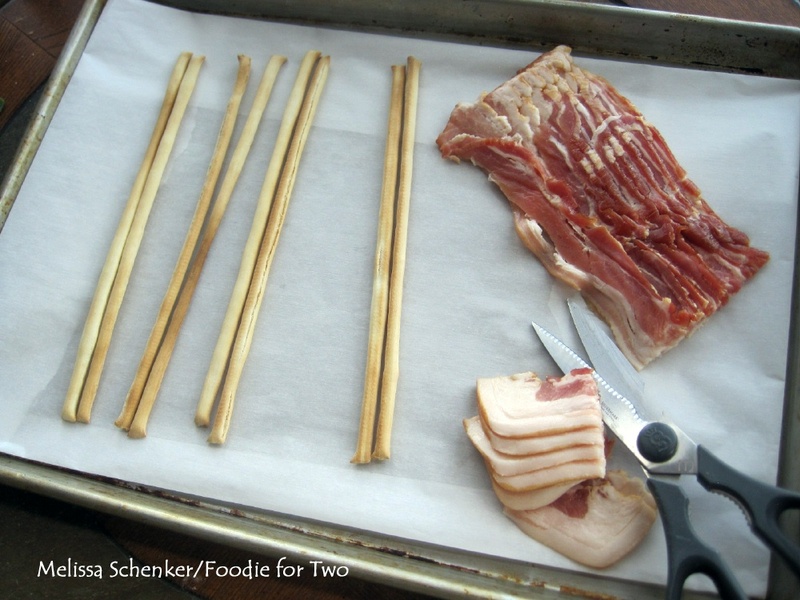 Starting at the top of the stick, place one end of the bacon piece and hold with your fingertips. With your other hand, start rolling the bacon around and down the bread stick. The bread sticks break easily and it takes some practice so go slow and gentle. Keep slight tension on the bacon piece while wrapping. It’s helpful to have a few extra bread sticks on hand. When finished, place the wrapped bread stick on the sheet pan and continue wrapping the rest. Cook for 18 minutes, turning sheet pan 180 degrees halfway through the cooking process, until the bacon is just starting to firm up and get a little golden. Using metal tongs, roll the grissini sticks in the grease to make sure the sugar has something to stick to. Transfer two sticks at a time to the sugar mixture and gently toss to well coat the bacon. Place back on the sheet pan and coat the remaining sticks. Return sheet pan to the oven and cook the grissini for another 8 to 10 minutes until bacon is golden and crispy. Let cool about 10 minutes and serve. Here is a scrumptious and mouth-watering appetizer that you can nosh on this holiday weekend. The idea isn’t a new one, but it’s different and so delicious that it deserves some new recognition – Bacon-Wrapped Dates. How can you go wrong with bacon as one of the main ingredients? 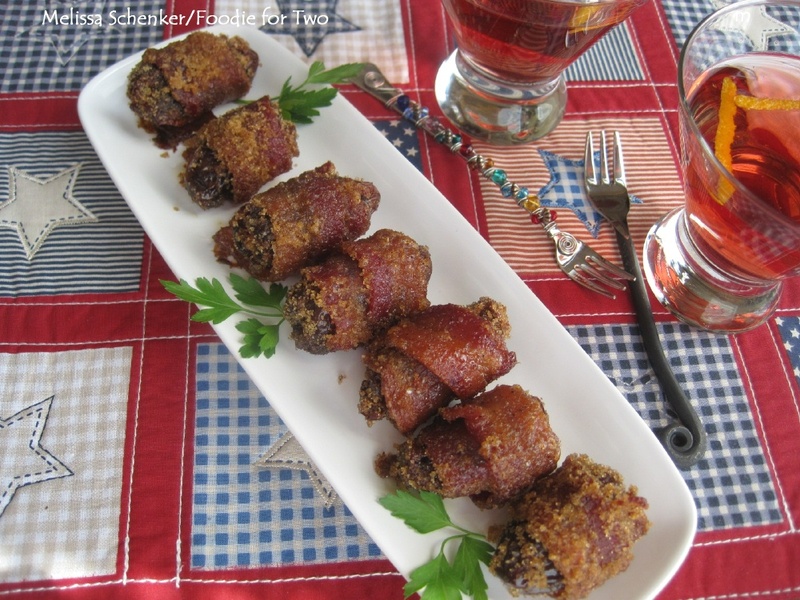 The pitted medjool dates are wrapped in bacon and then generously coated with a sugar mixture that has a mild hint of heat from chipotle pepper. The bacon becomes a crunchy and savory sweet wrapper that is caramelized from the sugar, and the fleshy date gives this wonderful explosion of sweetness. The total cooking time is about 30 minutes but they are so worth a warm kitchen. 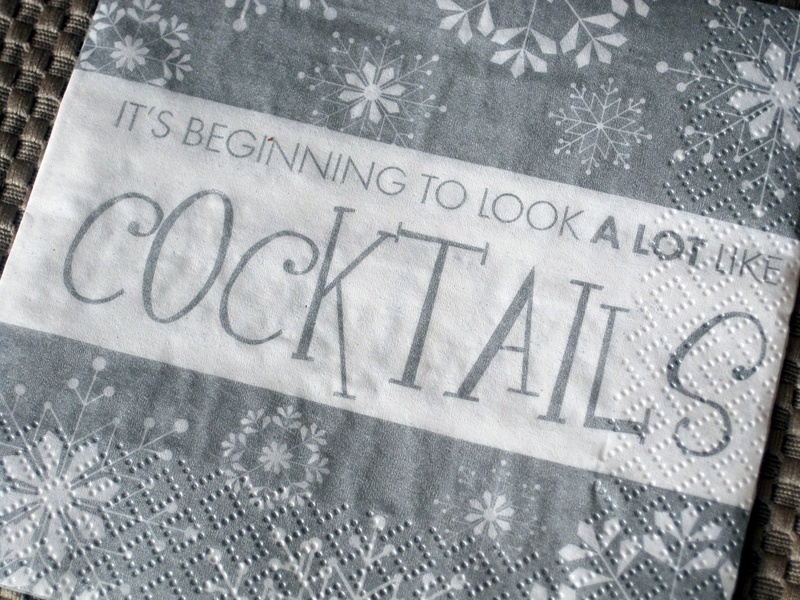 Serve them warm, with cold Cosmopolitan’s (David makes the best!) or your favorite beer. Now it’s time for a game of horseshoes in the backyard! There is a trick to getting the bacon to cook completely after it’s wrapped around the dates: pre-cook the slices until they almost done before rolling up the dates. Then the bacon dates get well-coated in the sugar mixture and go back in the oven to caramelize and finish crisping up the bacon. My favorite bacon is the all natural kind without any added nitrates or nitrites (when on sale, I buy four or five packs and freeze until needed). It has better flavor, more meat and is better for me. I also recommend using medjool dates, originally from Morocco (were reserved for royalty) and grown in California and Arizona. They are larger, about 3 times, than the bagged dates in the grocery aisle and have more fruit that stands up to the cooking process. I found them in the produce department of my local grocery store. The sugar mixture is made with brown sugar, chipotle pepper powder, cumin, salt and pepper. It’s the magic that transforms two ingredients into delicious little candy bites. Enjoy! 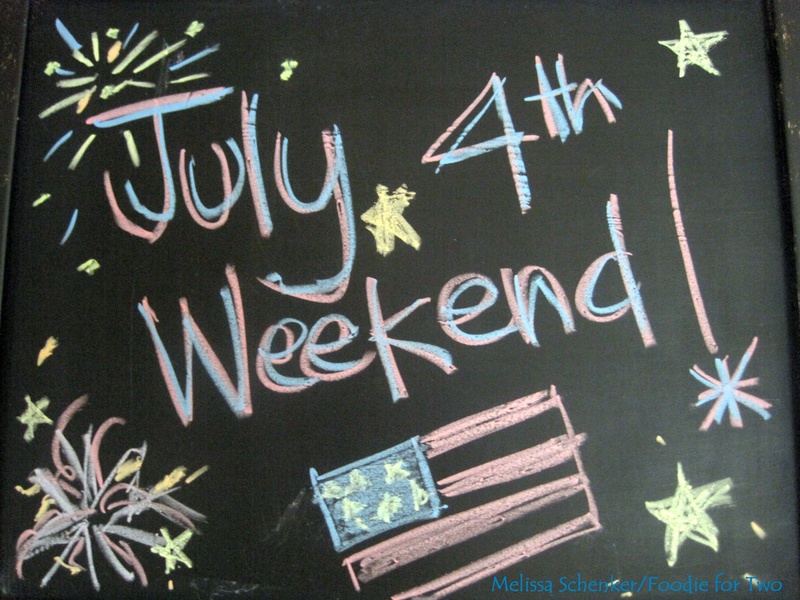 Have a wonderful, food-filled July 4th weekend celebration. Be safe – eat well and share the love! Prep: Pre-heat oven to 375 degrees F and line a sheet with parchment paper. You won’t need the whole piece of bacon to wrap around the date; cut off the last quarter of the bacon slices and save for later (store in small Ziploc bag and freeze), separate and lay the bacon slices on the sheet pan. Bake in the oven for 14 to 15 minutes until bacon is almost done. Turn bacon slices over at 9 minutes. While the bacon is pre-cooking, make the spicy sugar: Add all the ingredients to a medium bowl and mix well with a fork. Cover with plastic wrap until ready to use so it won’t cake together. When done, remove bacon from the oven and let rest for a few minutes to cool. To roll the bacon around the dates, place the date at one end of the bacon slice and roll up to cover most of the date. Lightly dip the bacon-wrapped date in the bacon grease on the sheet pan and then in the spicy sugar mixture. Liberally coat the whole surface with the sugar and return to sheet pan, seam-side down. Cook for another 13 to 15 minutes until the bacon is just starting to crisp up and turn dark. Let cool and serve warm. To remove the pits from the dates: Use a paring knife to cut a small hole in the end of the date and gently squeeze the pit out with your thumb and forefinger. If needed, use the paring knife to coax the pit out. Don’t worry if the date tears while removing the date; the bacon will cover it all up. Bacon-Wrapped Dates can be made one day ahead (store covered in the refrigerator) and reheated before serving – 375 degree F oven for 10 to 12 minutes until bacon is just bubbling.